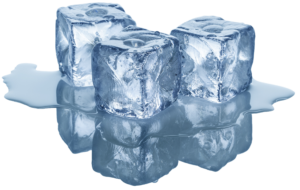 Last summer, when writing blog articles about standard kitchen equipment (the ice box), and ice delivery, I came across superb resources about how ice was actually cut to then be stored and sold by ice companies throughout the year. 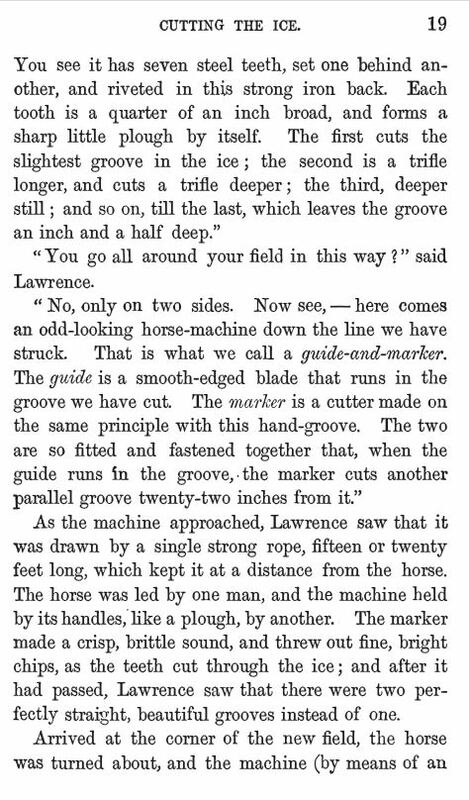 This source is an 1870/1871 publication titled Lawrence’s Adventures, by J.W. 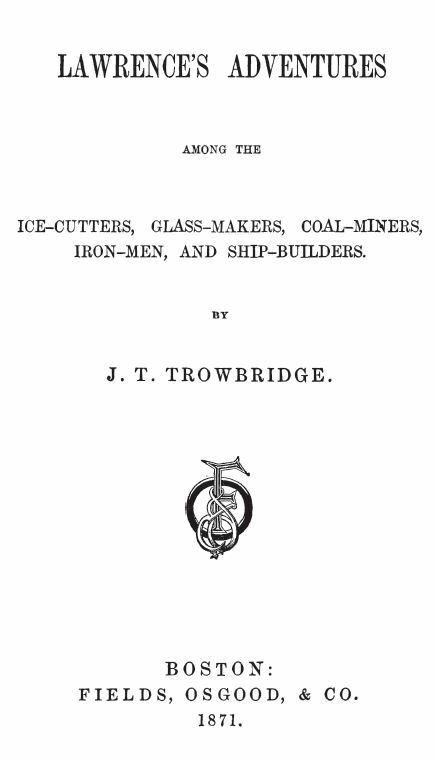 Trowbridge. 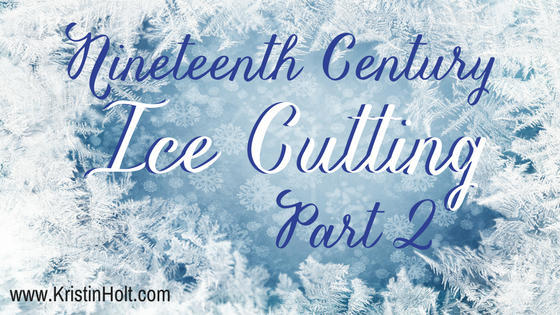 One chapter is devoted to Ice-Cutters. 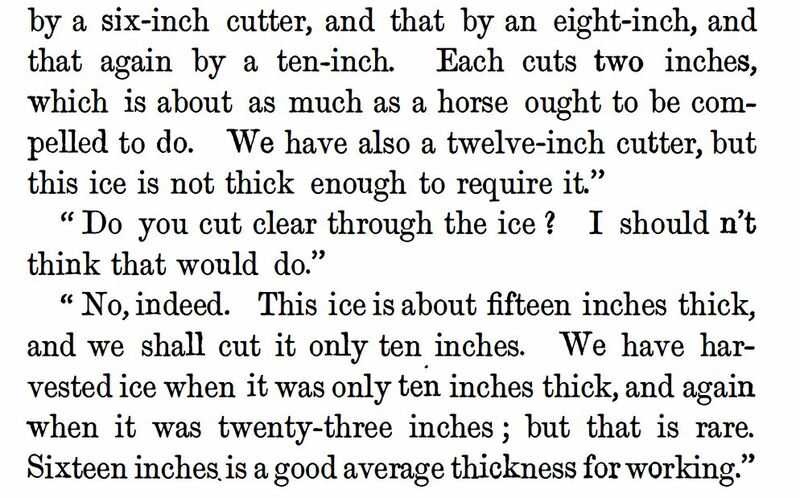 I share that (Public Domain) information here. 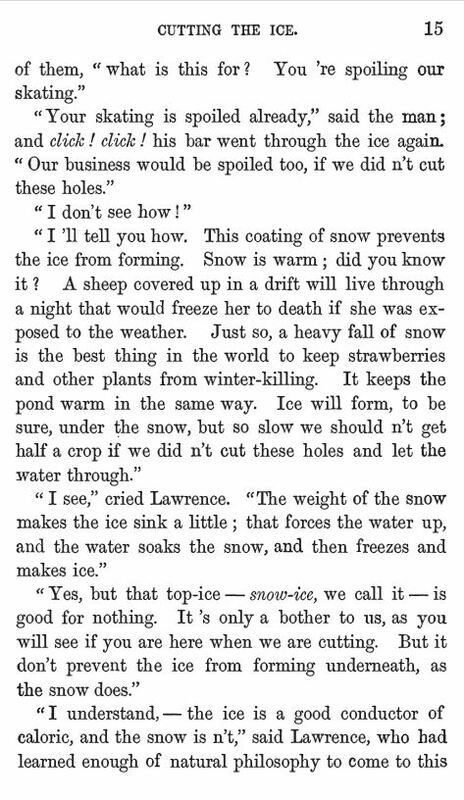 Lawrence’s Adventures, published in Boston (United States of America) in 1871. 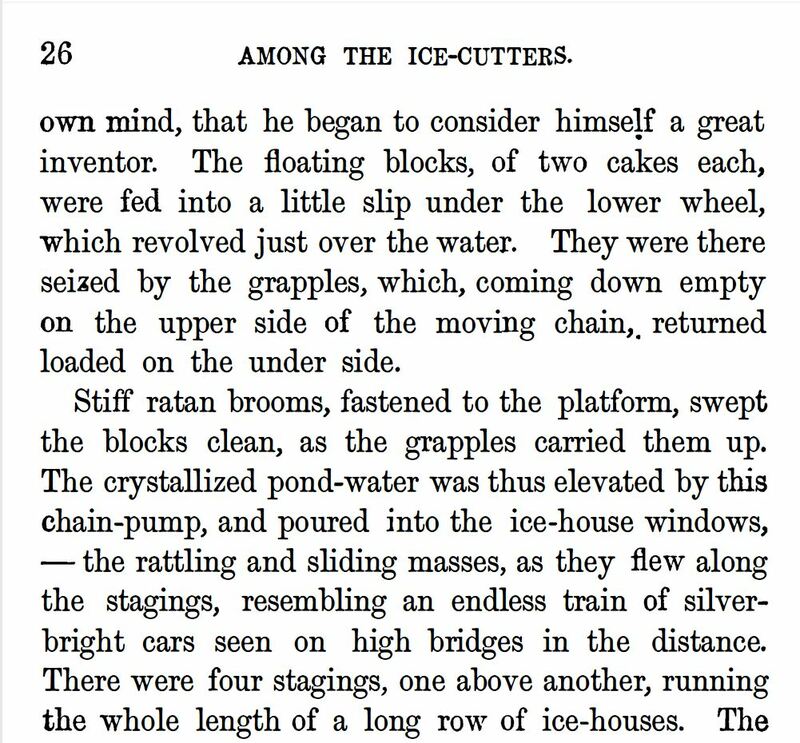 Entered into the Library of Congress in 1870. 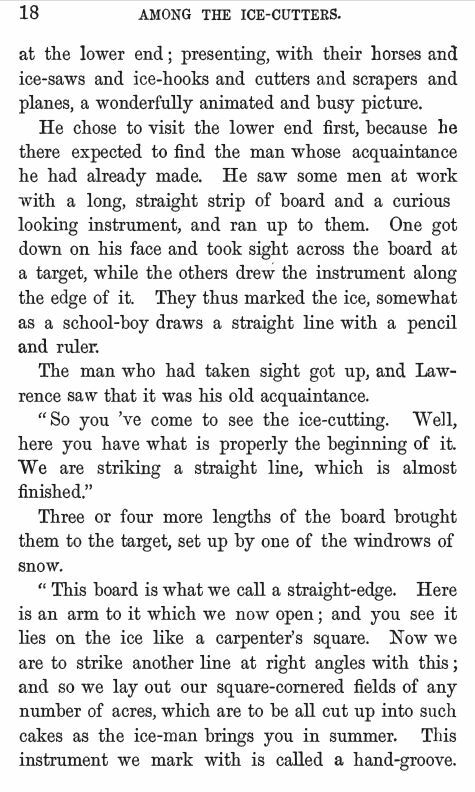 The following snippets are taken from this Public Domain title. 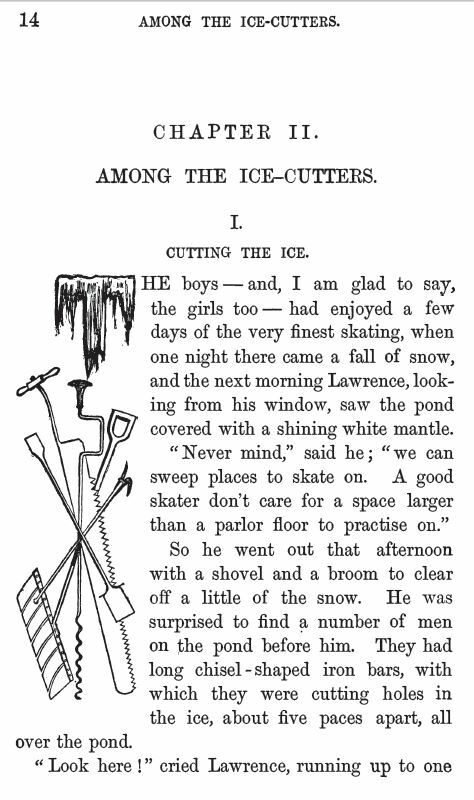 PREFACE to Lawrence’s Adventures, clarifying that this boy’s “adventures” are instructive and entertaining. 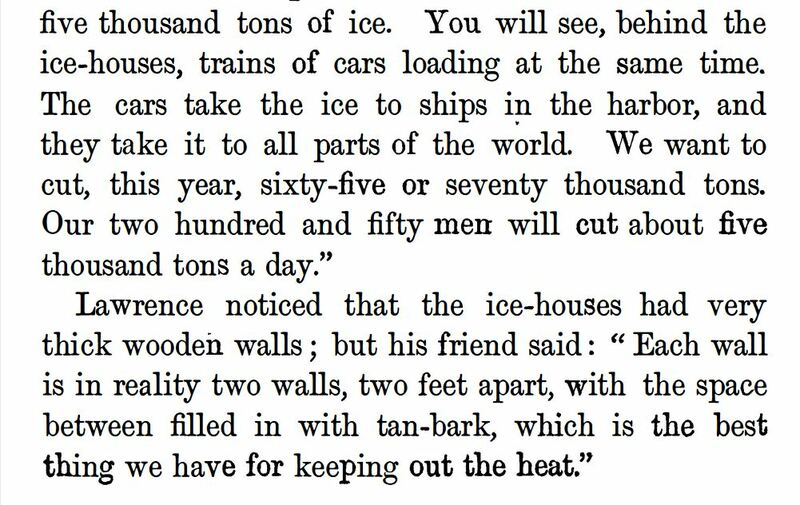 Written by the author, December 1870. 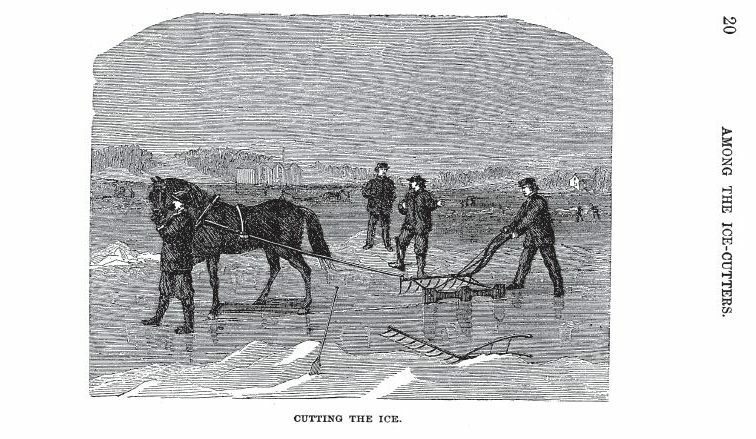 Lawrence’s Adventures, Page 20, image of horse-drawn ice-cutting work. Lawrence’s Adventures, page 21, part 1. 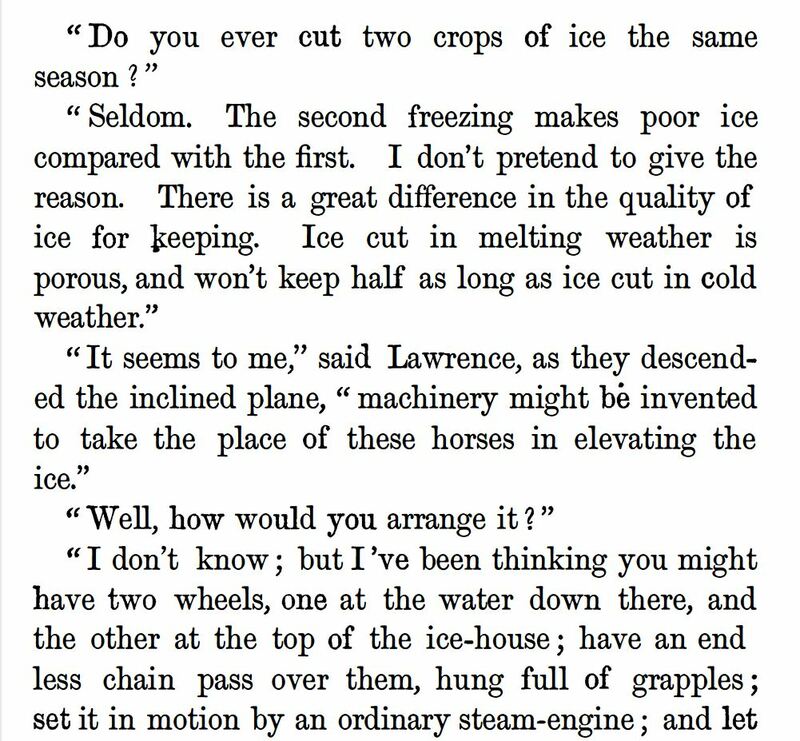 Lawrence’s Adventures, p 21, part 2. 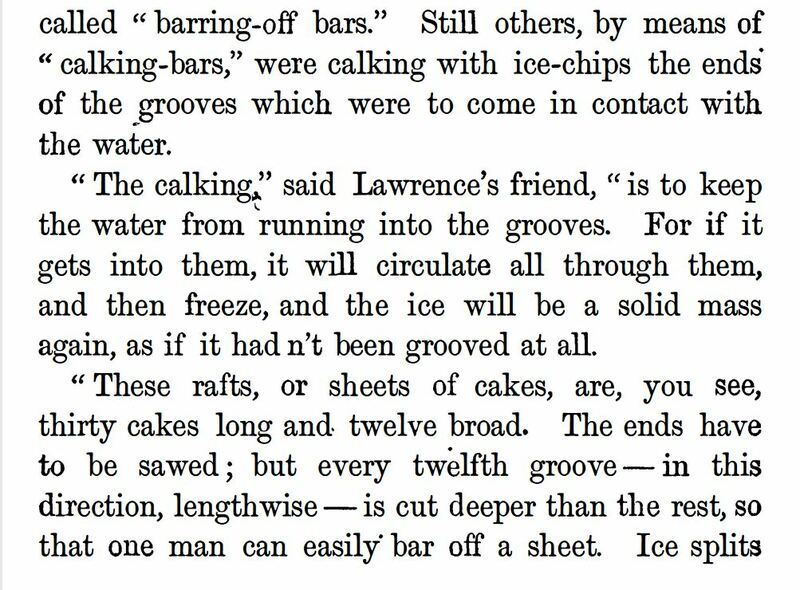 Lawrence’s Adventures, p. 22 part 2. 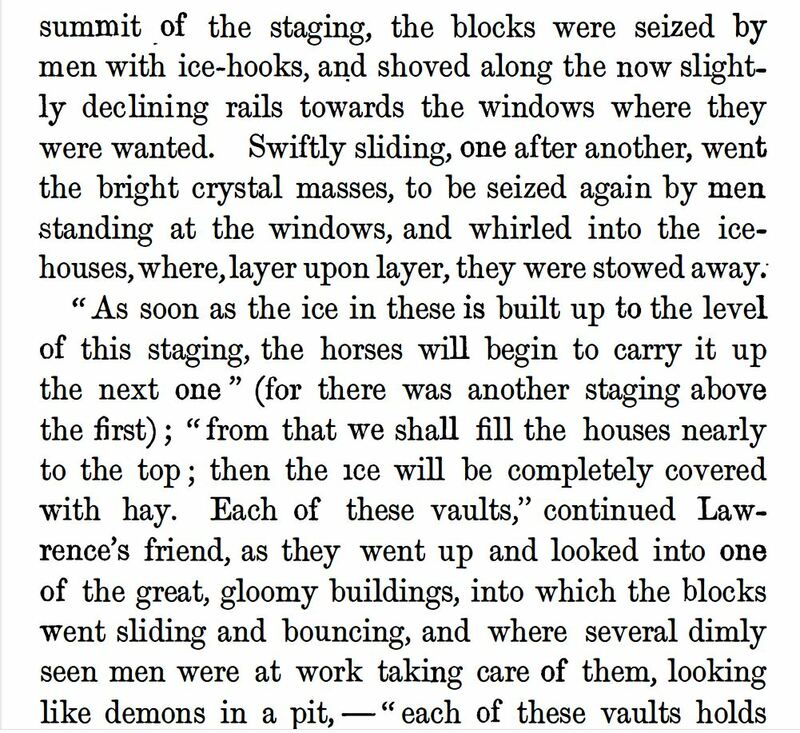 Lawrence’s Adventures, P. 23, Part 1. Lawrence’s Adventures p 23, part 2. 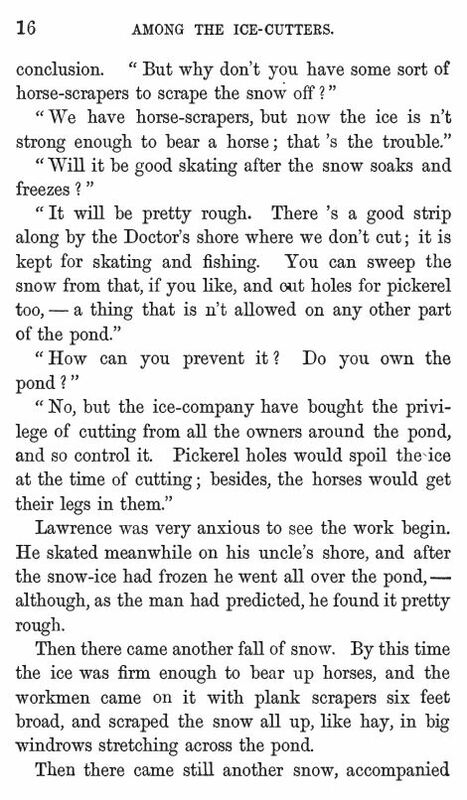 Lawrence’s Adventures, P 24, part 1. 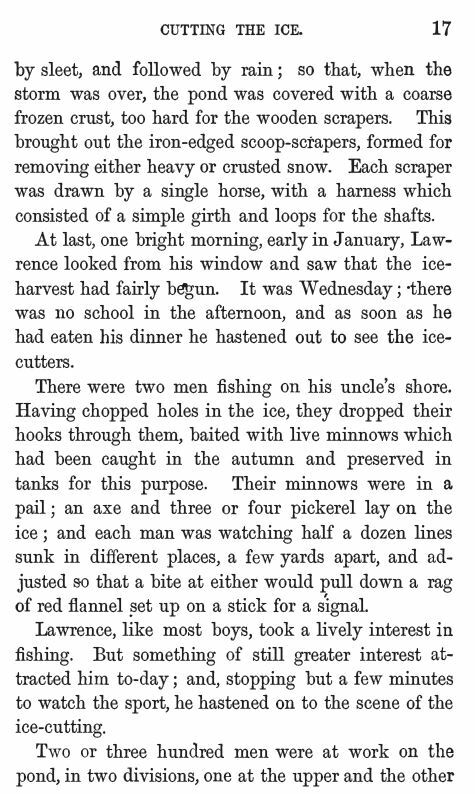 Lawrence’s Adventures, P 24, part 2. 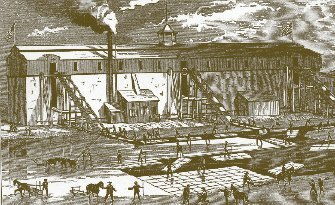 View of an ice harvesting operation, showing the storage house, boiler house and three elevators, as well as various operations on the ice. 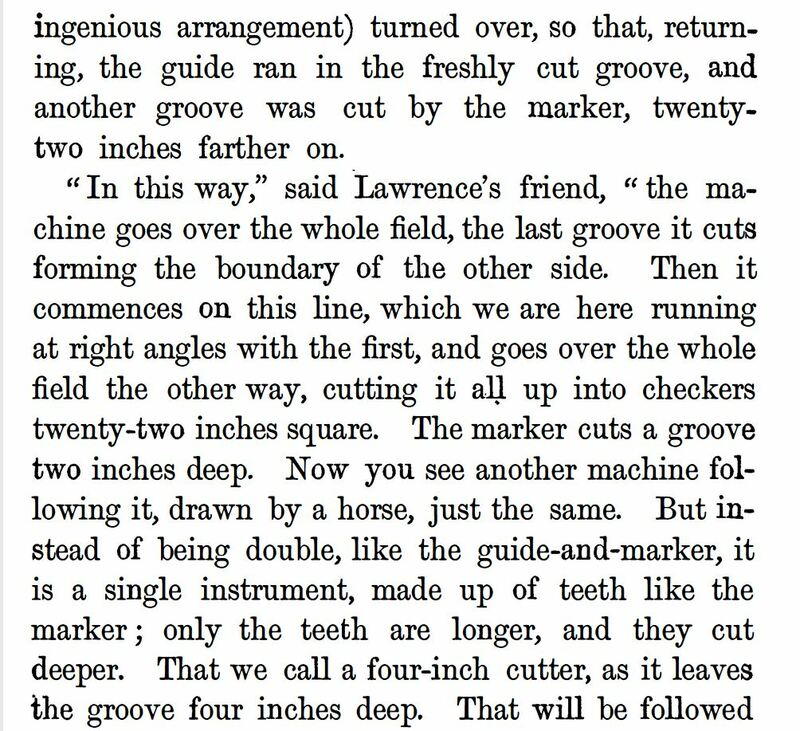 Appletons’ Cyclopaedia of Applied Mechanics, published in 1885 [source]. 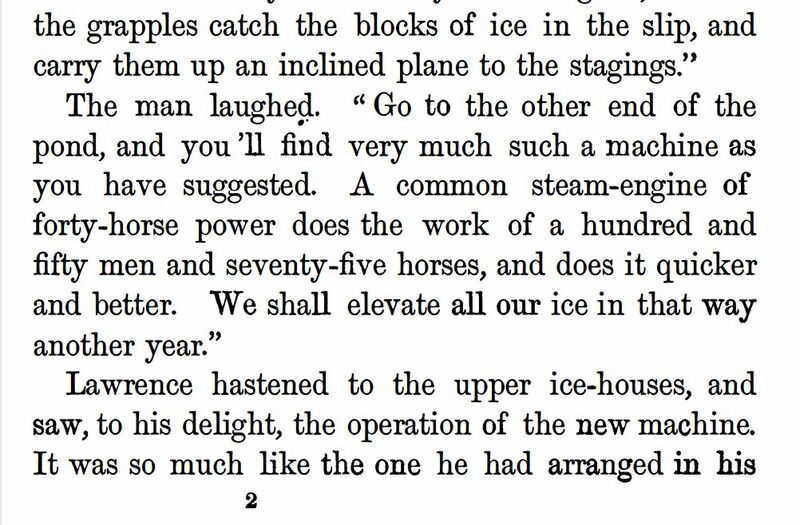 Lawrence’s Adventures, P. 25, part 1. 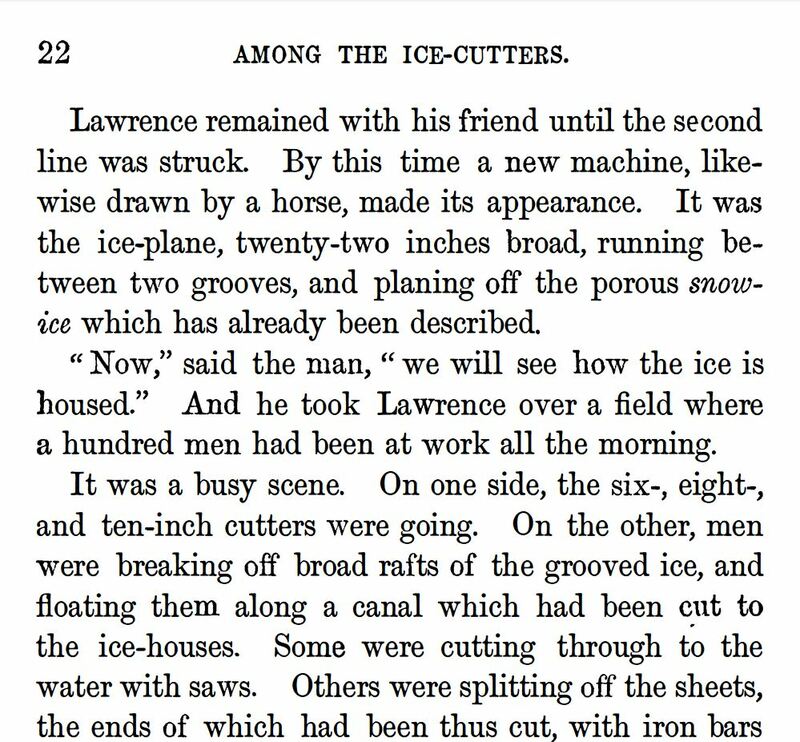 Lawrence’s Adventures, P. 25, part 2. 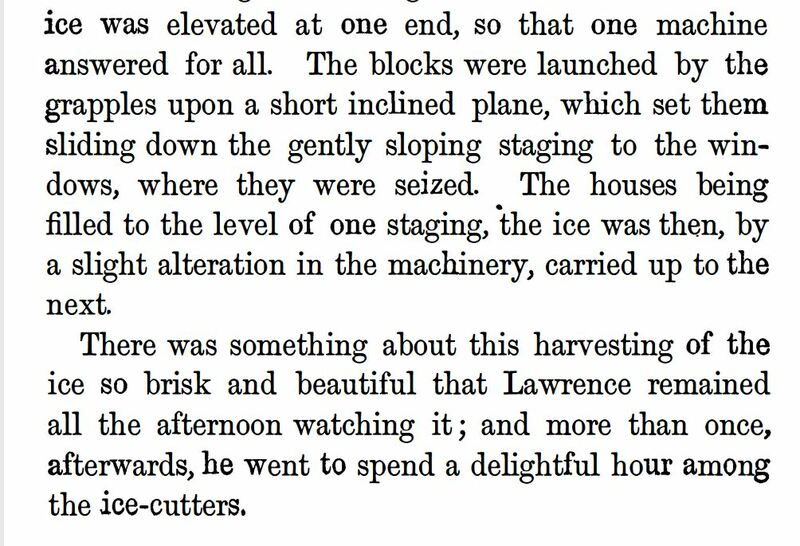 Lawrence’s Adventures, P. 26 part 1. 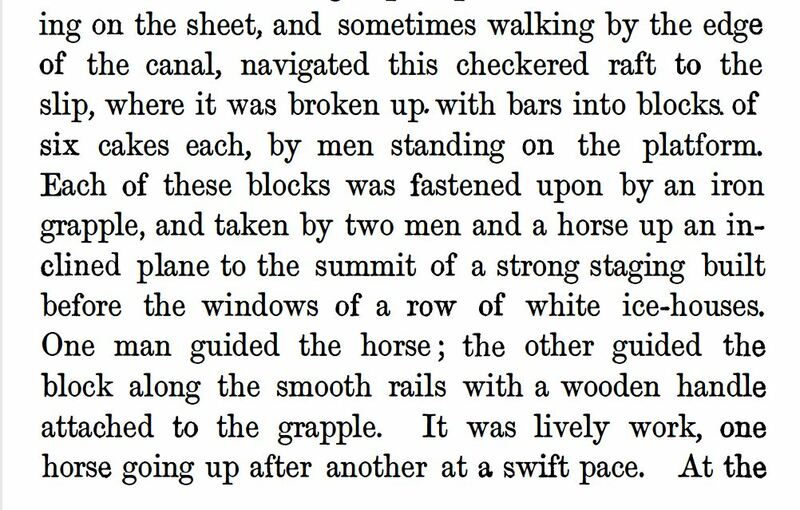 Lawrence’s Adventures, P. 26 part 2. It’s always a pleasure to have you drop by. This was a fascinating article, Kristin. Thanks so much for sharing it. 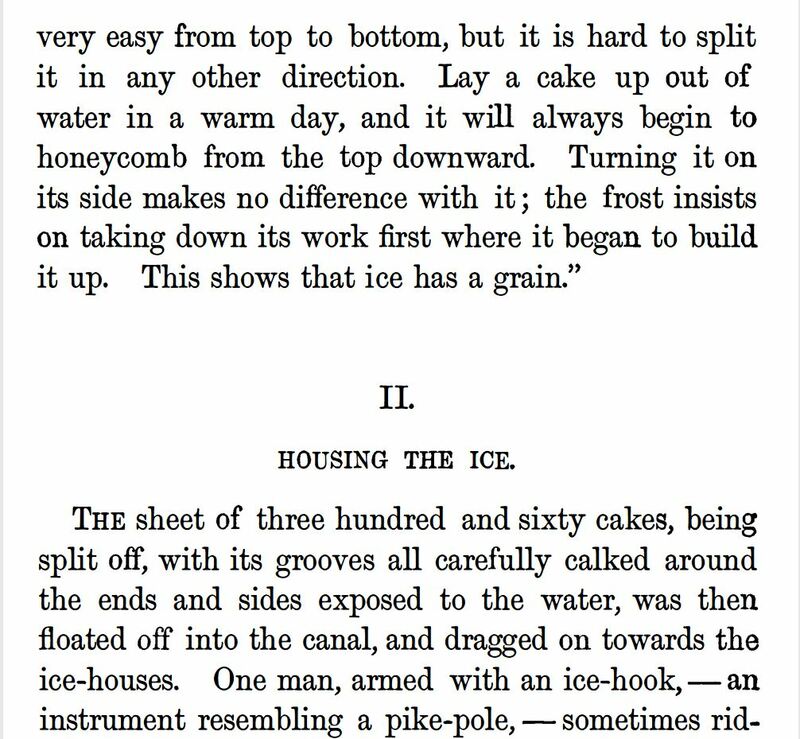 I had a scene in Gloria’s Song about harvesting ice for the pub, but the process wasn’t as detailed as this. 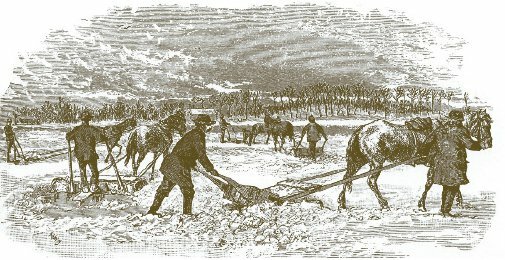 It was also being done by two men…not a whole group of workers. This was really fascinating! Thanks! GLORIA’S SONG is quickly rising to the top of my TBR list–and am so anxious to get to it. I’ve loved the book or two I’ve already read of yours, and I fully anticipate LOVING Gloria’s Song. Thank you so much for stopping by, reading, and contributing to the conversation. 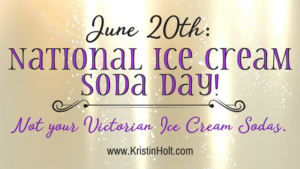 It’s been a genuine pleasure rubbing shoulders with you online today! Wishing you much ongoing success with your new release in Grandma’s Wedding Quilts Series…and the next title, and the next!